Inspired by the intimate scale of a Japanese tea house and the compact efficiency of a smart car, a team comprised of researchers from London and Munich developed the Micro-Compact Home (m-ch) as a short-term living solution for students, business people, and weekend vacationers. Sleek, minimal, and modern, the m-ch design gained immediate attention, and it’s now in use throughout Europe. Living in an m-ch means focusing on the essential concept that less is more, and all the amenities of home are micro-sized. The tiny cube provides a double bed on an upper level and working table and dining space for four to five people on the lower level. The entrance area has a triple use: it functions as a bathroom and drying space for clothing, in addition to a lobby. Not only are these micro-dwellings mobile, they can be grouped together to create family units, a student “village” on campus, or even an apartment complex. As individual units, they’re ideal solutions for adding a bit of extra space to an existing house, whether to give a teenager a private living area of their own, or to create a quiet office space that’s separate from the rowdiness of the rest of the home. They can also be plunked down on a tiny piece of land overlooking a lake or ocean as an ideal weekend getaway cabin. Costing just 38,000 Euros, this little prefab integrates state-of-the-art technology into its compact design, boasting a sound system, flat screen TV, and temperature controls. It requires no furniture and all storage space is cleverly concealed within the structure of the dwelling. Are there any websites that offer plans for convertible/dual purpose furniture? I'd be interested in seeing an expansion of the application beyond the prototype. The villiage concept is interesting. I'm not certain as to what the benefit is. An apartment building or condominium utilizing the same environmentally sensitive constructs would likely be more cost effective? The system is trailerable/towable...by the smart car? I am skeptical especially considering the frontal area (air drag problems) even if the weight is within specifications fo the vehicle. For 50,000 Euros sans modern styling one could purchase a very substantial and environmentally efficient modular home. This home seems to be targeted toward the single, well to do idealist rather than providing a practical alternative for a family or in most cases even an individual. We offer off the power grid homes of this type and size starting at 9,995.00. Video on YouTube site name "chinadepot" Price includes solar lighting system, and continuous composting toilet with tank under floor. How do we do it? Mass production in factory. I'm designing a home of this type for myself. I had drafting in high school and I've come up with a radical new floor and roof. Now I' thinking I may want an even smaller studio under the home for temporary housing while I build it. LOVE your site. Thank you. ets. Dude! seriously thats lame, you would be better of getting a caravan and getting a custom fit out done, it would cost not even a 1/4 of that price. I'm a musician 2nd, a human 1st, and can't afford a house or even food because I am not willing to sell out to low frequency thinking. I am willing to happily live without though so I can serve the whole. It's not about poverty, it's about quality of life. So when I do have stuff, of course I have the best. And more than important than that, I have my time. Let's start a community of these houses for ambitious entrepreneurs of the future of life on planet earth. Nothing new. Anyone out there have land we can start on, ..in a city, of course! Since it would show others how to live right! It would be a real cost business that would build the future of human life on earth. THe most important business in the world! (if your human). It would have to be live / raw food, really sustainable, really intelligent thinking design that provides for all life, not just the rich and insecure. It would give people the time and space to finally start working out what's kept us all in the dark ages for so long. It would eliminate "there is not enough" mentality. A chain is only as strong as it's weakest link. What could be more fun and rewarding then a place to brainstorm and manifest quality of life for all?! Im very interested in see more models on the micro mini homes. Thank you. A home for people who don't have to shower or use the bathroom? I like the concept but reality crushes this like a tin can. Big problem is storage space - where does even a modest collection of clothes, books and sports gear get stashed? Living here would mean outsourcing your laundry, cooking, and storage among other basic functions. $ 45,796.18 US Dollars = INSANE. Just a wee bit greedy? MAX PRICE: $9999 Thanks for the concept, that you could find in any Truck Bed RV design… OH, and no place to wash your clothes, I guess you just stink ? No place for a TV or Computer - Informationless existence? Needs a DISH on top for HDTV reception.... If you could order it on-line, the Max Price was $9999, and it could be installed permanently by local crew, or just Wheel mounted for camping - that would be great. Otherwise - a completely flawed failed idea from the get-go. Mass Production should Earn $2000 profit on every $9999 unit sold... There is no market for something with all the flaws of a camper, with none of the benefits of an RV. Looks very uncomfortable. The transition from standing in the kitchen, cooking, to sitting at the table, while holding one's dinner plate, drink, cutlery, etc. would be a real challenge.. but as every surface looks to be hard and sterile it probably wouldn't be too difficult to clean up the mess. And where's the bathroom in this..? I'm not sure I'd want it so close to the kitchen/dining area.. could get kind of gross, especially if you have more than one person living in it. You could forget ever eating Mexican food again after moving into this Kinder toy. No.. this is just a very silly and short-sighted idea. But it could have one useful purpose; forcing futuristic home designers to live in it to teach them to design for people, not mathematical representations of the Ideal Man. Yes, I would like to see a family of 4 really live in this closet for more than year without go crazy or the need for a shrink! Any possibility of sales in the United States? if not, any restrictions on importing one in? I live in a six foot square home it's made by Volvo. I Drive a Semi Truck. Like the other visitors I would like to see people living in it and a floor plan. The volvo has a double bunk sleeper the passenger side has a closet behind the Air seat. The console behind the Drivers seat was removed before I got the truck. This area has a large bin that holds a porta potti and lets me use a portable shower with a plastic curtain. I have a chest refrigerator that fits between the seat. I have a small buffet burner and some pots so I can cook on the side of the truck. Cooking odors are too strong inside a small space. I like the guy from Idahos idea of a BBQ window so you can cook outside and stay in the house. I am so excited about this product. They are not available in the United States just yet and am looking forward to it. hmm -- maybe they just need a local reseller...... just give me a ring! It is true these are probably furnished through an Ikea format - but it does not have to be. I see great things in this guys future -- and hopefully mine! As for greening the project - I do think there should be a standard solar power package and possibly a water catchment / UV purification system. As I have researched it is a wood frame and would seem to convert well to stardard SIP panels. Also I would LOVE to see geek2's 144sq/ft layout. I have not tried to create my micro house that small- but I will give it a shot. Nice but I'm slightly skeptical. I'd like to see more interior pictures, particularly of the kitchen facilities, bathroom, and sleeping area. A house needs to accommodate four basics: sleep, eat, wash, and poop. Function comes before form; we live in our entire bodies not just through our eyes. IMO, the greatest value of sub-micro house designs is to provide design concepts that can be used in larger houses i.e. micro or mini. I designed a microhouse floorplan for 144 square feet, and managed to fit in all the basics while remaining ground-level accessible (for example to an older person who can't climb stairs or ladders). Going from that to a design with 250 square feet, the added space seems downright luxurious! (77 square feet is a challenge, approx 8-3/4 feet by 8-3/4 feet; I admit I haven't tried the exercise on that scale but may do it just to see how it comes out:-) The goal is not to squeeze oneself into a closet with running water, but to build in a manner that is efficient and sustainable and lasting, and to provide the basis for personal touches that make the place a home or at least a nest. What beautiful small houses! They can shelter us when we need it, let the outside in and encourage us to go outside when we can. I love these little houses. only thing missing is the hitch and wheels. These look like mass produced houes for mass production of cloning, like Domo Arigato Mr.Roboto, a Sci-fi house, perhaps from Animal Farm. Perfect housing for clones. Fantastic! Would love to see anything similar to this. I am trying to find more floorplan information for the "Micro Compact Home". Should anyone have information, images, links, or clues as to how the multipurpose entryway is configured, please let me know. Thanks in advance. Es un placer para mi estudiar una propuesta esencial,M?nima,para disfrutar el entorno y aportar. Soy arquitecto y artista Colombiano. Gracias. I like it a lot but it seems a bit expensive, about the same price as some homes with land here in Tasmania. How is it heated or cooled? At just 77 square feet, the micro-compact home might seem small, but is an ideal size for a weekend getaway. The micro-compact homes can be grouped together into little villages, like in this student housing complex. These mini houses have been installed all over the world, though the majority of them are in Europe. 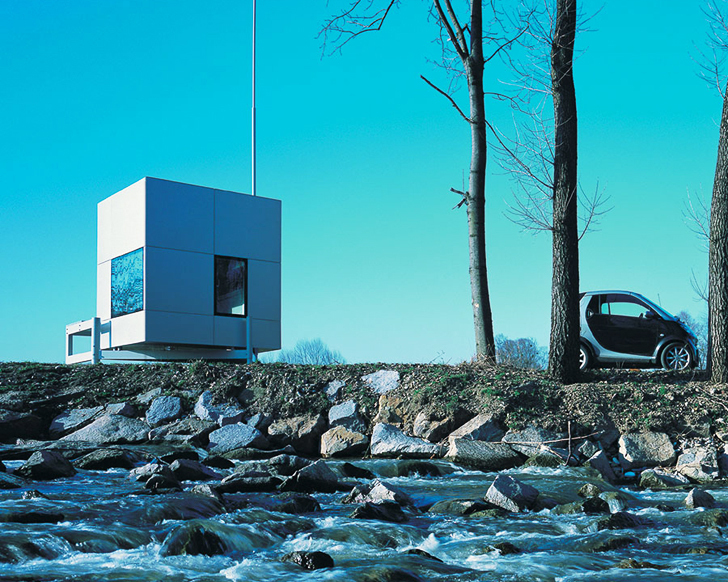 Micro-Compact Homes have sleek, modern interiors in which no amount is ever wasted. Because of their small size, m-ch units are ideal office spaces or add-ons for existing houses. Since they're so portable, m-ch units are also ideal retreats, as they can be plunked on even the smallest parcel of land. There's a lot packed into a small space, and the entryway includes a washroom (with shower), sink, and sitting area. It's amazing to see so much living space in such a small building, but efficient design makes even the smallest home a beautiful luxury retreat.